The elephant in the room for Intel’s new Cascade Lake CPUs is quite simple, pricing. The only problem is that as SemiAccurate sees things, prices either went way up, stayed the same, or didn’t go down, all depending on how you look at things. If you read our earlier Cascade Lake piece you probably noticed that we didn’t make a call on how good, bad, or otherwise it is because that conclusion depends mainly on your viewpoint. The same holds true for pricing. What do we mean by that? 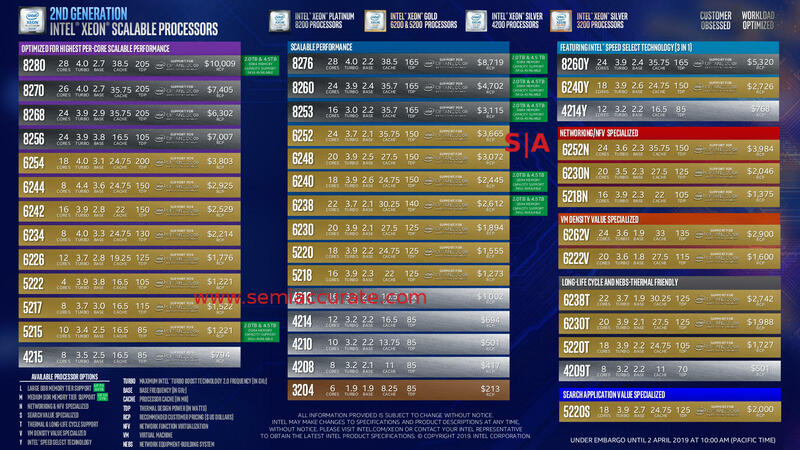 It is a long answer starting with the official line from Intel that prices are roughly the same as Sky for the same SKUs. Lets start there, take a look at the prices across the board. As you can see the prices for Cascade Lake are indeed just about the same, usually to the dollar. That is good. Most of the SKUs got a little faster too both in base and turbo frequencies, another good thing, plus a few had TDP decreases. In short from the first glance Cascade is indeed better than Sky in just about every way, not overwhelmingly so but enough to notice. The first big asterisk is that the new features like Speed Step Technology and Xpoint DIMMs are mostly done with new suffixes, -S and -N parts are indeed more expensive than their non-suffixed counterparts. This increase ranges from $102 on the 5218N to $319 on the 6252N, both are less than 10% of the MSRP so not exactly gouging but it is more for a feature that ‘should’ be built in. The price is effectively bounded by the next SKU in the stack, something Intel stays well below on the -N SKUs. The -S SKUs do not have a direct counterpart to Sky so make of them what you will. Is this a price increase? Is it paying a little more for something that allows you to avoid buying a higher SKU and underclocking it to save TDP? It depends on how you view things. 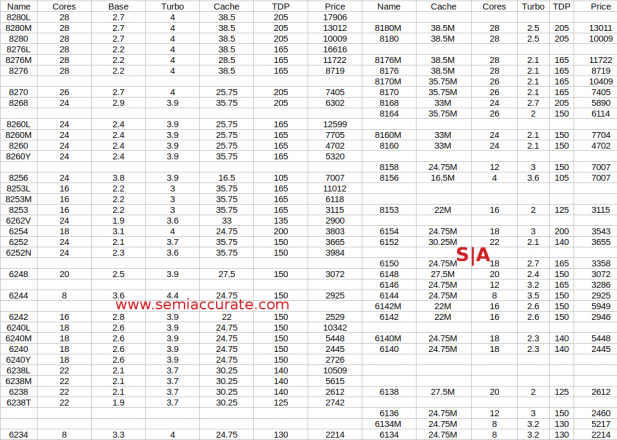 Then we have the big bang, the -L SKUs for large memory support. On Skylake the -M suffix allows you to avoid the artificially low 768GB memory cap per socket and enjoy up to 1.5TB of memory for the low cost of $3002. If we wanted to be snide we would point out that this was a great deal compared to what Intel charges on Cascade for -M suffixes, $3003. Seriously though the limit was raised to 1TB on Cascade so you get a bump of for ‘free’ this time around. Price increases aside, the -M SKUs now up the limit to 2TB so that is ‘better’ too for .033% more money, a ‘good deal’ once again. Then there are the -L SKUs which further up the limit to 4.5TB per socket for a mere $7897. One thing to consider is that the lowest end part with M/L capabilities is the 5215 which costs $1221 because it has two more fuses blown than the 5215L which retails for $9118. Fair? The 5215-nothing costs the exact same price as the 5115 and has a 100MHz higher base clock. Fair? Gouging? Once again, it depends. One thing you can’t question is the price for the top of line 8280L CPU, $17,906. Last May SemiAccurate said it would hit $20,000 which at the time it was. Since then the prices for Cascade have moved around a lot on the MSRP side and it looks like there is indeed an ~10% price drop for this chip. Or you can say it is an ~$8000 increase for not blowing two fuses. 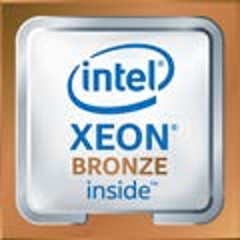 Either way you pay a great deal for large memory support on the Cascade Lake Xeons, $3003 or $7897. Intel will argue that if you need large memory support, the price of 64/128/256GB DIMMs will dwarf this price increase so the ‘value add’ is worth it. Same for Xpoint DIMMs, if your app benefits from the support it is well worth the extra to avoid buying more servers to do the same job. Both are fair points and value depends on your workload. All in all though this is one case where we don’t see it the same way, the artificial memory caps are nothing more than gouging clients pure and simple. Their magnitude in indefensible and while optional, make the non-M/L CPUs look inferior. To make matters worse the only NVM solution that can make use of these SKUs is made by Intel, it is unlikely there will be another vendor in the mix before the next gen of Intel server CPUs hits the market. M/L pricing are own goals that will leave a bad taste in customer’s mouths for a long time to come. As with the technology itself, the last point depends on whether you see pricing in a vacuum or in the entirety of the market. Do you price Cascade against Power, ARM, or AMD? 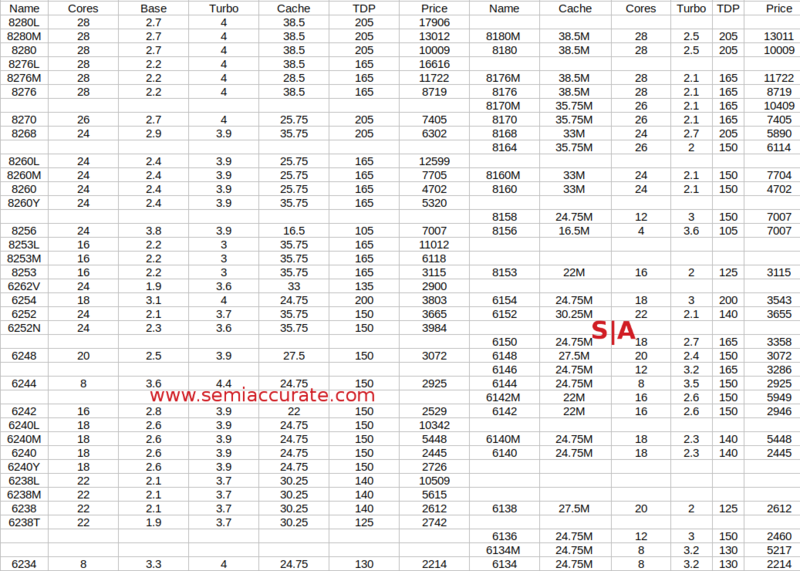 If you only look at previous Xeons Cascade is more for the same cost. AMD’s Epyc CPUs top out at around 90% of Cascade’s performance for 1/4 of the price. Power and ARM are a little harder to directly compare but both have options that offer far better price/performance than Intel for some workloads. No matter how you look at it, Cascade is a minor performance bump over Sky, 10% at most barring a few specific tasks and code that is recompiled for VNNI. AMD is behind but will leapfrog Intel on per-socket performance with Rome in two months gaining a 50%+ performance per socket lead. Where they put pricing is an open question but if AMD doubles their MSRP it will still be half of the top Cascade Lake part. The mainstream CPUs are likely to be less of a lopsided victory for AMD but they should still cost a fraction of Cascade. The problem for Intel is that for the last two+ years, their performance has effectively stood still. Until Cooper Lake launches in 2020, Cascade is all they have and a 10% jump in speed doesn’t cut it in the server market on that cadence. So is Cascade a good deal? With respect to Xeons, yes. With respect to AMD, ARM, and IBM it is the proverbial hitchhiker coughing at the side of the road in the dust cloud of the trucks delivering the competitors CPUs. This is the long way of saying Intel Sky and Cascade Xeons are priced way too high versus the rest of the market and are going in the wrong direction. Or are they? Intel talks about delivering value, not increasing prices by four digit numbers. If your code benefits from VNNI, is a $18,000 Xeon better than a $4500 Epyc? Maybe. Is there support, features, or safety in buying Intel that sway your decision? Maybe? Kickbacks, MDF, or soft money? Possibly. Even with the lopsided win for non-Intel solutions on price performance, you can argue, ‘it depends’ in a few cases but those are getting fewer and fewer every day. There is one last elephant in the room, non-MSRP aka Tier-1 pricing for large OEM/ODMs. There have long been rumors about what this class of customer actually pays, but the official numbers are both customer specific and ‘off book’ private. SemiAccurate has outed some numbers on this topic in the past but things have been changing quite a bit since then. The old rules of thumb are no longer so lets take a look at trends in Tier-1 pricing, in round terms so as not to out any of our sources.